In September 2018, SCOR Global P&C announced a new organizational structure, designed to address the evolving needs of its clients and to reinforce its Tier 1 position in a rapidly changing risk ecosystem. The new structure consists of three business areas – Reinsurance, P&C Partners and Specialty Insurance – which work alongside transverse functions to ensure strong technical drive, supervision and governance. 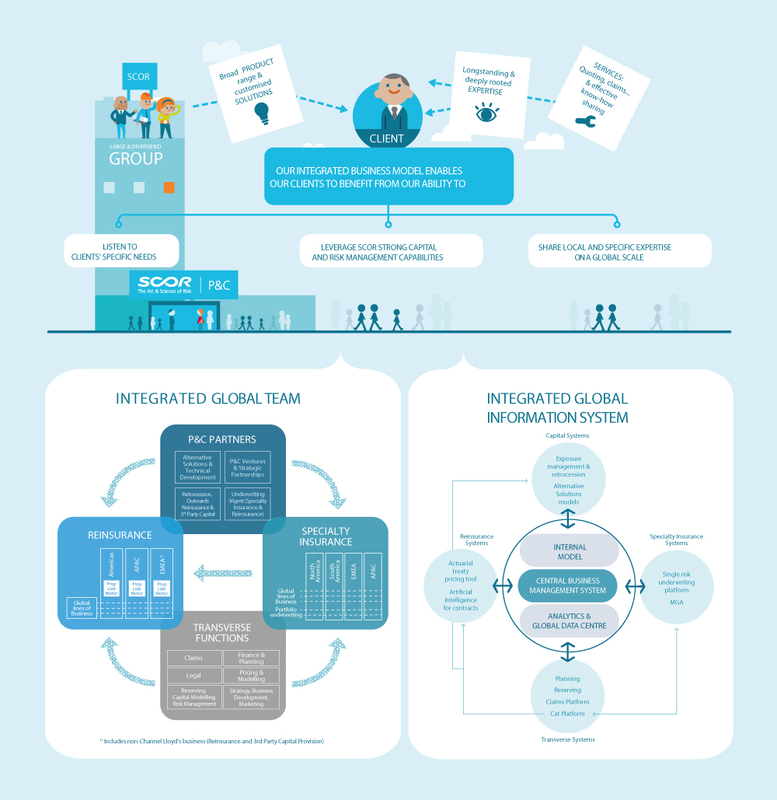 The global, integrated team relies on a sophisticated and global IT infrastructure, which helps to safeguard SCOR’s reputation as a trusted, long-term trading partner for its clients. The new structure and its scalability support the ambitions of SCOR Global P&C and its clients for the future. Pricing Actuarial teams work closely with the Underwriting teams in the offer of solutions to our customers’ risk management needs. Working on a deal by deal basis, the pricing actuaries make financial projections and then quantify the risks according to characteristics of the customer’s portfolio, the terms and conditions, and specific market and economic outlooks. The quality and consistency of the analyses is enhanced via the expertise and market know-how of underwriting teams and by working with and relying on the expertise of the other transverse functions. Regular portfolio analytics, the application of a strong governance framework, and the development and maintenance of the global Pricing Tools and Systems support our work. For many clients, catastrophe risk modeling lies at the heart of SCOR’s technical, risk-based approach to underwriting. SCOR has consistently supported excellence in modeling and risk taking more generally through both internal R&D efforts and support of industry-wide efforts. We have developed new catastrophe risk modeling technology, both proprietary and open source. More broadly, the team supports SCOR’s efforts to model, monitor and manage risk aggregations across the book. The Catastrophe Risk Modelling team is also keen to share knowledge, providing SCOR Campus trainings to clients and writing scientific publications. The Administration & Finance department handles a wide range of operational matters in support of the business as well as clients, investors, and regulators. The team handles all core finance functions such as the financial planning and reporting, solvency and capital management, business analysis, methods and process, internal controls, as well as technical accounting. The central team located in Paris operates with the strong support of local teams for managing the overall network of entities and branches. The swift payment of covered claims is the fundamental promise in every (re)insurance contract that SCOR writes. The Global claims team staffed with industry experts is here to make that happen for our clients. We offer clear communication and a consistent claims philosophy so that we can provide support every step of the way through the claims process. Our aim is to ensure our claims service promotes and strengthens long term relationships with our business partners and their customers. The Legal team provides concise, accurate, and timely legal advice in support of the company’s commercial objectives and obligations concerning legal, regulatory, and compliance matters. Legal experts sit in each of the hubs and work closely with other departments such as Claims and Underwriting. Actuarial reserving teams are located in major SCOR offices in Europe, Asia Pacific and the Americas, benefitting from local knowledge and expertise. Working closely with Finance and Claims departments, our actuaries enable SCOR to provide prudent management of the company’s reserves within a strong governance regime. The team works closely with other internal stakeholders such as Risk Management and the Group Internal Model team to ensure the long term stability of the SCOR’s solvency. The Risk Management team structures all relevant risk management activities, tools and governance across the non-life Division, which aim at monitoring, challenging and advising on risks within the frame of the fully integrated ERM Framework. The overarching objective is to ensure that the risk profile is in line with the risk appetite, preferences and tolerances set for the Group. This is achieved by a range of mechanisms, amongst others the quarterly risk assessments and analyses conducted via the Risk and Capital Committee. Periodic business portfolio reviews are led by the team for identifying and sharing risk related practices around Underwriting, Pricing, NatCat modelling, and Claims, and for fostering the risk culture across the organization. Responses to regulatory requirements, such as Own Risk and Solvency Assessments, are centrally coordinated to ensure a maximum of consistency, efficiency and business relevance. Quantitative and qualitative risk analyses and opinions are provided for business plans and initiatives in order to ensure critical risks are considered within business decision-making. The team monitors the effectiveness of the Internal Control System and provides expertise to process owners for a continuous improvement of the process design and efficiency. SCOR’s ERM expertise is furthermore shared with clients through tailor-made trainings, forums and exchanges with SCOR’s experienced team of risk experts. Strategy and Development is a cross-functional team responsible for SCOR’s 3-year strategy, business development (both organic and inorganic), broker relationships, planning, and InsurTech. The team has diverse backgrounds including staff hired from top-tier consultancies, investment banks, reinsurers and insurers, and other professional services companies. The team is an entry point to SCOR P&C for insurers, brokers, or entrepreneurs with innovative new business ideas including InsurTech-related opportunities. The Marketing team, part of Strategy & Development, formulates and executes marketing strategies and plans. The team also manages SCOR’s training center for clients, SCOR Campus, and publishes experts’ views in Technical Newsletters.